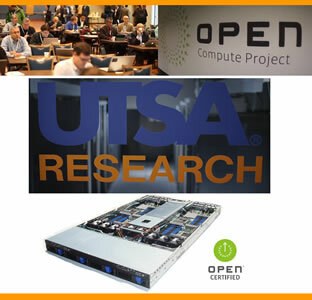 >> View a video on the UTSA Open Compute Certification and Solution Laboratory. (Jan. 28, 2014) -- The University of Texas at San Antonio (UTSA) has launched the first Open Compute Certification and Solution Laboratory in North America with support from the Open Compute Project (OCP) Foundation. Frank Frankovsky, chair and president of the Open Compute Project, made the announcement today at the annual OCP Summit in San Jose, Calif.
UTSA and the Industrial Technology Research Institute (ITRI) in Taiwan are now the first designees in the world with an Open Compute Certification and Solution Laboratory. As the Open Compute Project continues to grow and as its partner community designs and builds more and more OCP platforms, the laboratories will provide a transparent, community-based approach to address quality assurance and to ensure systems meet their specifications for enterprise production deployment. "As the neutral third-party responsible for testing the quality of new technologies on behalf of the Open Compute Project, UTSA will have a front-row seat to emerging trends in scalable computing," said George Perry, dean of the UTSA College of Sciences. "That insight will create wonderful learning and research opportunities for UTSA students and researchers. It will also nurture partnerships with leaders in the technology industry." The OCP Foundation is comprised of engineers and technology leaders from around the world, dedicated to designing and enabling the delivery of the most efficient server, storage and data center hardware designs for scalable computing. Members include Facebook, Rackspace, AMD, Intel, Avnet, Mellanox, Quanta and others. The organization believes that openly sharing ideas, specifications and other intellectual property is the key to maximizing innovation and reducing operational complexity in the scalable computing space. "By rigorously testing OCP designs in a trusted environment, the OCP certification labs will validate the product quality of open hardware solutions and help innovative technologies get to market faster," said Frankovsky. "The Open Compute certification team at UTSA provides invaluable expertise in ensuring that new products meet the community's standards around performance, reliability and energy efficiency, and are ready to deploy in today's data center." "The leadership at UTSA has been visionary with regard to co-investment in this certification program and partnership with the Open Compute community," said Mark Roenigk, chief operating officer at Rackspace. "At Rackspace, we believe Open Compute is going to be the next computing hardware platform to support all of the emerging cloud and big data technologies. The Open Compute community has some of the best talent and this partnership will create technology leadership for UTSA, San Antonio and the state of Texas. We want the best IT talent to stay right here in Texas." "We have a dual mission to foster open technologies such as Open Compute, OpenStack and ZeroVM while attracting students to, and educating them for, future employment in cutting-edge technologies," said Paul Rad, director of the Open Compute Certification and Solution Laboratory. The AMD Open System 3.0 and Intel Decathlete with high-memory capacity are the first systems receiving the OCP certified logo from UTSA's laboratory. >> Read quotes from other partners in the Open Compute Certification and Solution Laboratory. The University of Texas at San Antonio is an emerging Tier One research institution specializing in health, energy, security, sustainability, and human and social development. With nearly 29,000 students, it is the largest university in the San Antonio metropolitan region. UTSA advances knowledge through research and discovery, teaching and learning, community engagement and public service. The university embraces multicultural traditions and serves as a center for intellectual and creative resources as well as a catalyst for socioeconomic development and the commercialization of intellectual property -- for Texas, the nation and the world.